There almost couldn’t have been a better lure* to get me out to a press launch than combining an evening at a stationery boutique (squee!) 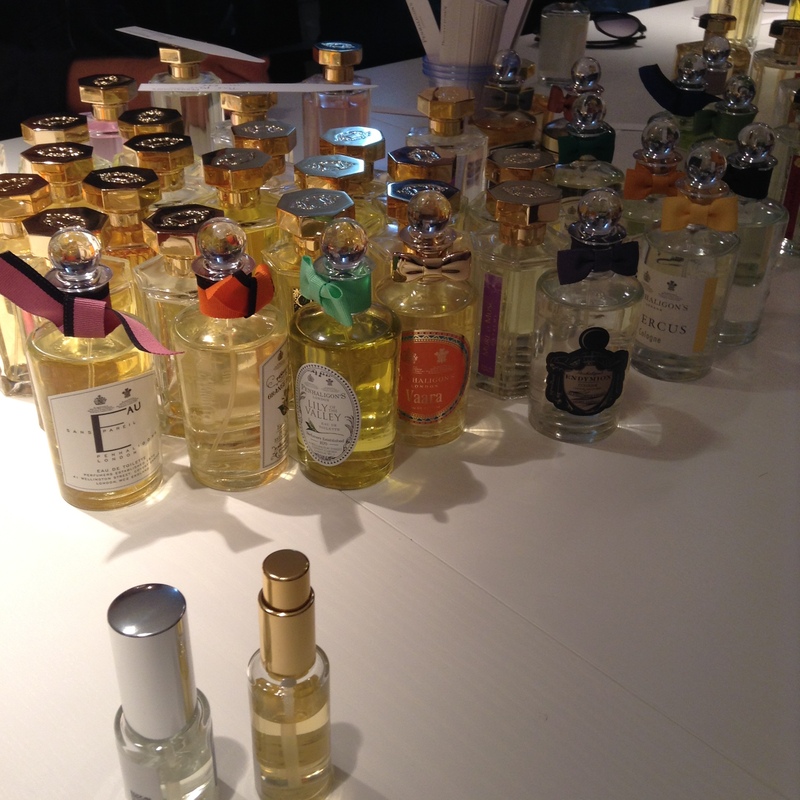 talking about perfume (yay!) 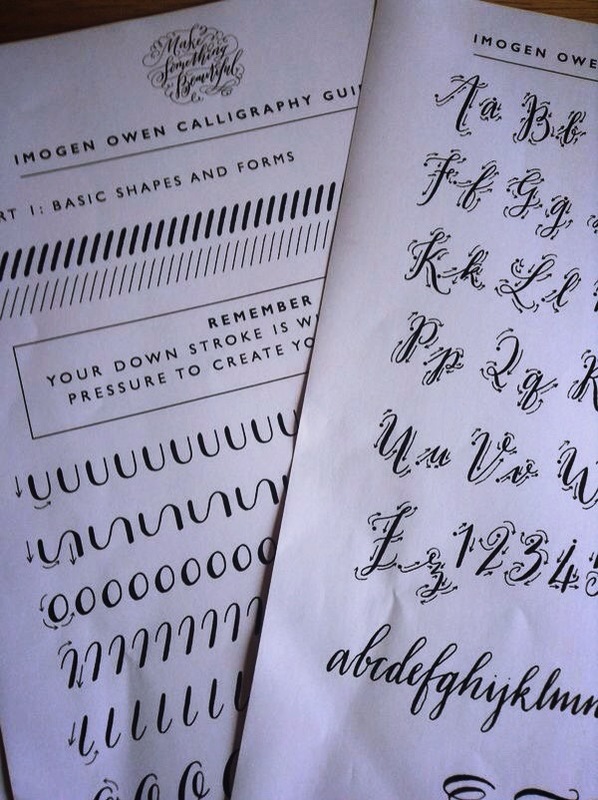 whilst learning calligraphy (wow!) – so the Yardley PRs didn’t really have to try hard to get me to come on over. I was also very curious to see what the classic British perfume house of Yardley would be up to these days because my last impression of it was that of a reliable but rather too safe a brand (though something I remember fondly from my make-up artist days when I’d always have a bottle of Yardley English Lavender cologne in my kit). 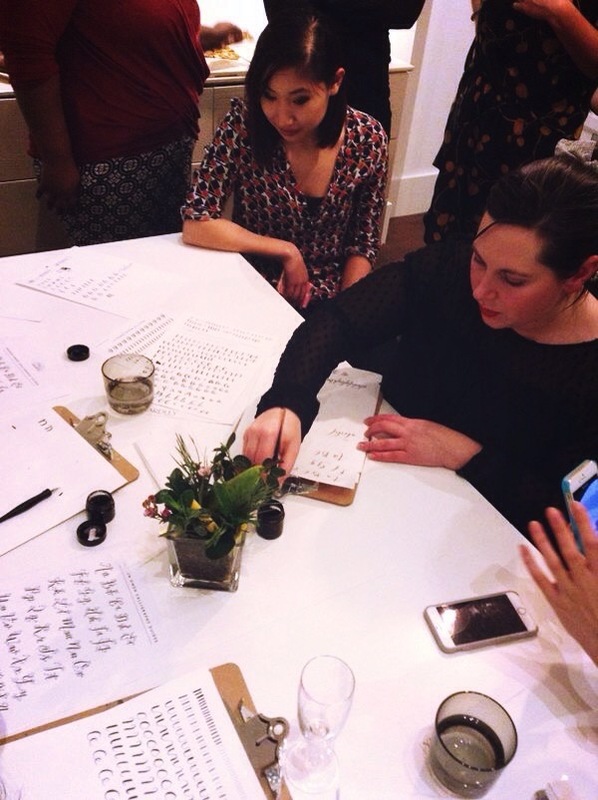 The evening was held at Quill London and our modern calligraphy workshop was taught by the sickeningly talented Imogen Owen. We were shown how just the right amount of pressure is required to create artistic, modern calligraphy with real flair. Settling down to the exercises, I quickly realised I had no natural talent in this art whatsoever and all my early attempts looked like a daddy long legs had fallen into a large jug of Pimms No1 Cup and drunkenly swayed back and forth on a page after an accidental encounter with an ink well. A few pages of exercises (and much diplomatic and kind encouragement from Imogen) later, I was quite happy with an ampersand. Yes. I can now draw a satisfactory calligraphy ampersand. Happily, Quill London and Yardley equipped us with a goodiebag that included everything we needed to continue practicing at home. Thank goodness. 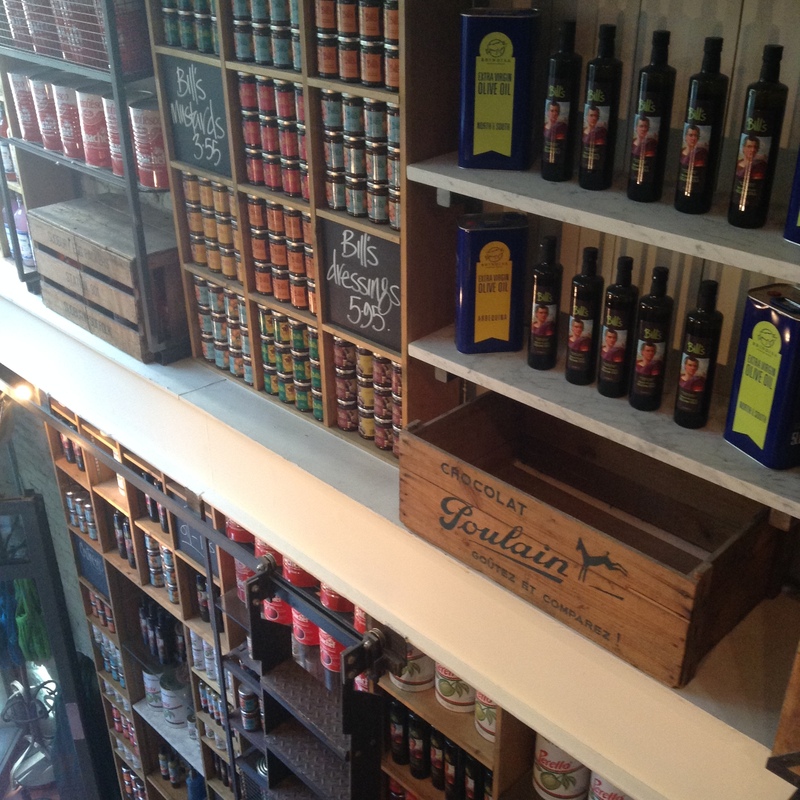 Yardley has been having a quiet make-over. Heritage brands can end up trapped by the very thing that made them famous in the first place. What happens when your original products are now thought of as old-fashioned and the newer generations think of them as something that just isn’t for them? Quality, reliability and brand recognition are all very nice things to have, but when we choose a perfume for ourselves, don’t we want it to be a little bit more… exciting? Back in the 70s and 80s, you’d get a few major fragrance launches a year and the kinds of affordable mass-market fragrances that were available didn’t exactly compete with fine fragrance – they were more distinct from the fine fragrance offering. Fast-forward to today: thousands of new fragrances each year across every price point and every conceivable market segment. We’ve got ultra-niche all-natural artisanal microperfumeries and super mass-market commercial blockbusters – and everything in-between. Consumers have more choice than ever, but this doesn’t necessarily make choosing easier. It can actually make choosing harder. And more choice doesn’t mean better quality. It’s hard for brands to stand out and to carve a unique niche. Who needs another perfume? Why now? What’s so unique about yours? 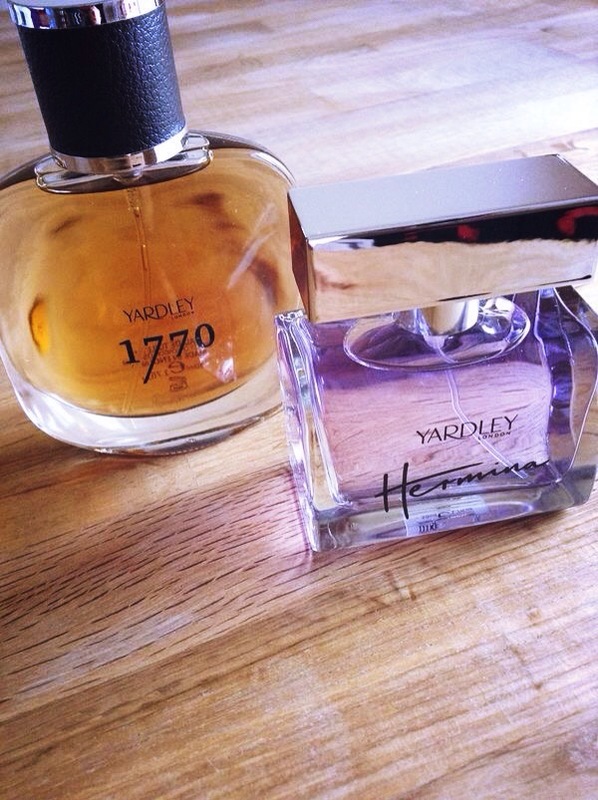 Yardley is turning to its heritage but they seem to be up to something that could be the Holy Grail of heritage brand revival if it works – apply a modern twist to its classic knowhow and remind people that yes, we know what we’re doing and have been around for hundreds of years, but we’re also up on modern trends and what people want from their fragrance today. One of the frustrating things about just wanting to smell good is that with all the thousands of fragrances out there, surprisingly few brands actually fulfil this apparently simple brief: an elegant fragrance that smells good and doesn’t cost more than a typical celebrity perfume. Of course we know that a huge amount of fragrance cost comes from advertising, packaging and other elements associated with creating those big, commercial blockbusters. But that doesn’t guarantee success – it just means consumers have to pay more (and may not end up getting a better perfume as a result because perhaps the perfumer or fragrance house wasn’t given an adequate budget in the first place). 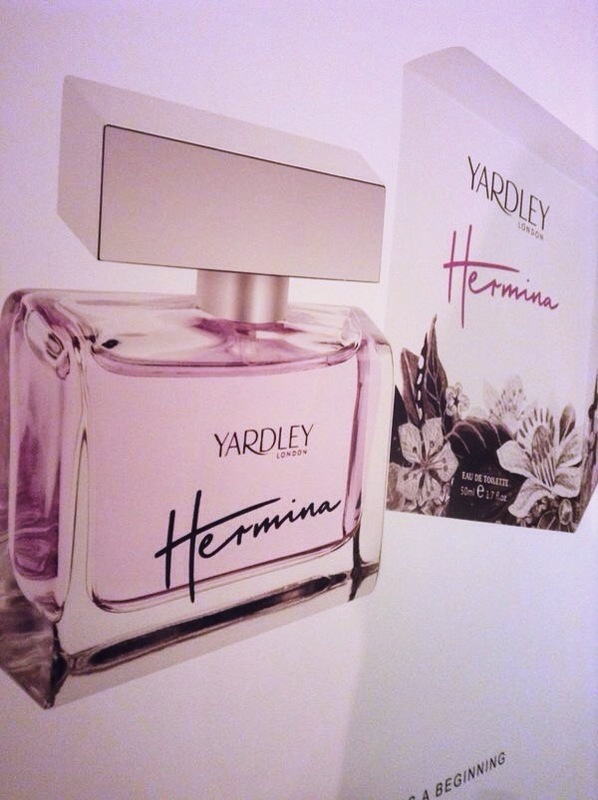 We were shown Hermina, which Yardley describes as hitting the androgynous trend of featuring masculine notes in feminine scents (and yes, this cross-referencing is a trend that’s happening both ways at the moment). Hermina is a crisp, elegant floral-woody chypre with a tart, fig and fruit aspect and a subtle, woody drydown. It could easily pass as a launch from a leading cosmetic brand; something you’d imagine a well-dressed professional woman or a glowing English country wife wearing (as she’s preparing that giant jug of Pimms No1 Cup, blissfully unaware of its hazards to passing daddy longlegs with calligraphy aspirations). Hermina was named after a real Yardley historical figure, the wife of William Cleaver and whose father (also William) was the first Yardley to officially own the business since the original founder. 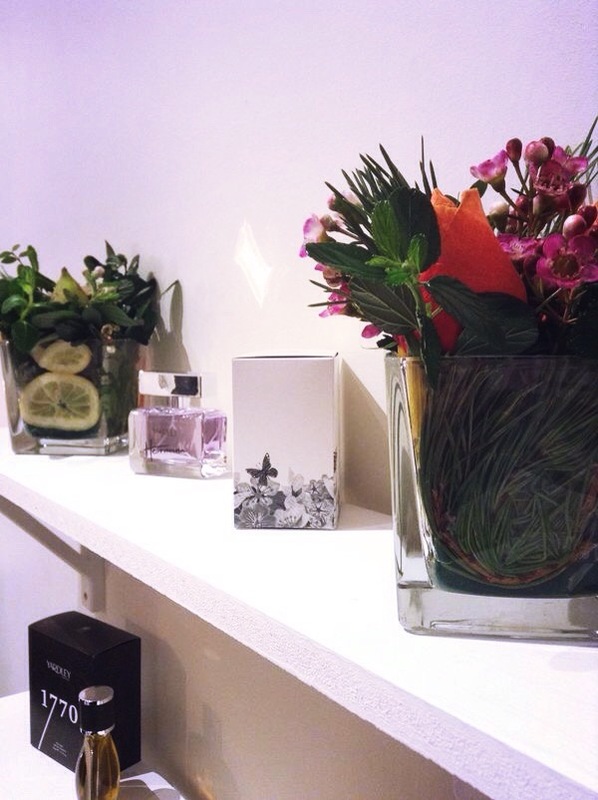 The fragrance was created by Nelly Hachem-Ruiz at IFF and retails at £19.99 for 50ml. We were also shown a new masculine fragrance, London 1770, and I thought I recognised the Robertet signature in it, and I was right – it was created by Jean Charles Mignon and Amandine Galliano from Robertet UK. It’s a warm, spicy, ambery fragrance that has a fruity twist and just enough patchouli and moss to give you a real feel of modern and classic in one fragrance. It smells very good, very wearable and for £19.99 for 50ml, I hope many, many men will practically bathe in it. 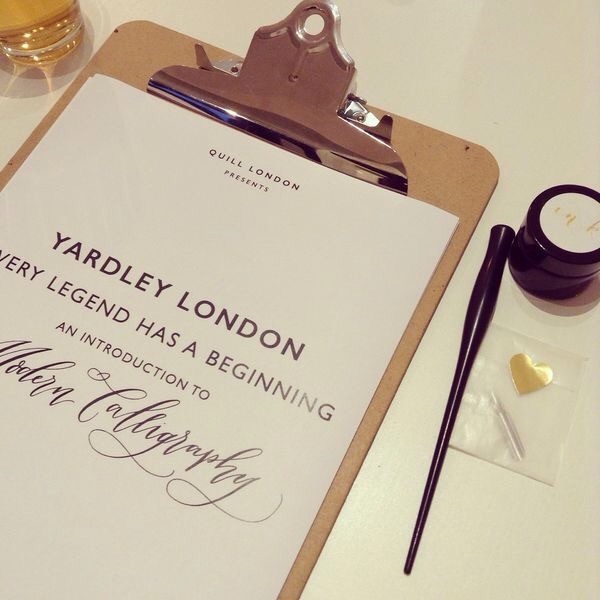 Having checked what other new fragrances Yardley has been launching recently, I noticed there is one called Ink – an award-winner, no less – and thought it was a bit of a missed opportunity not to at least bring a bottle of it for us to smell to a calligraphy evening. Alas! 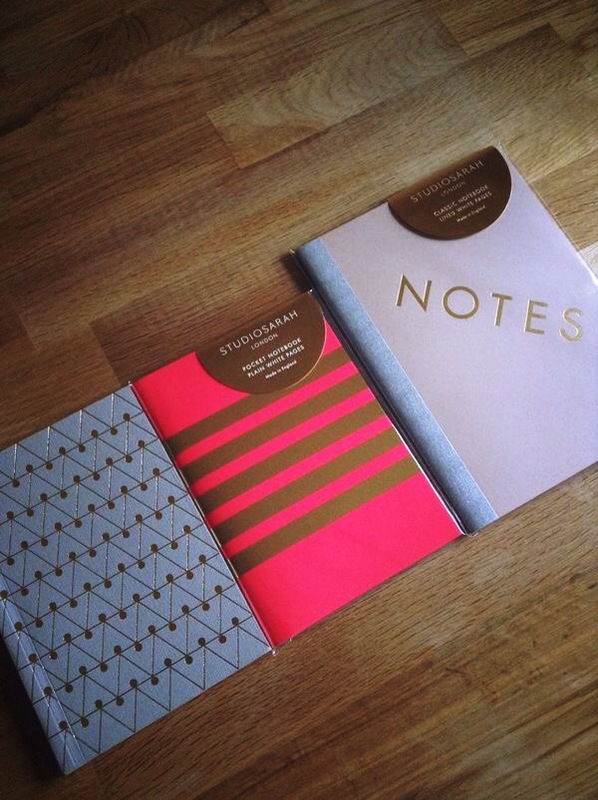 Oh, the notebooks! I couldn’t resist a little bit of sneaky shopping on the side. 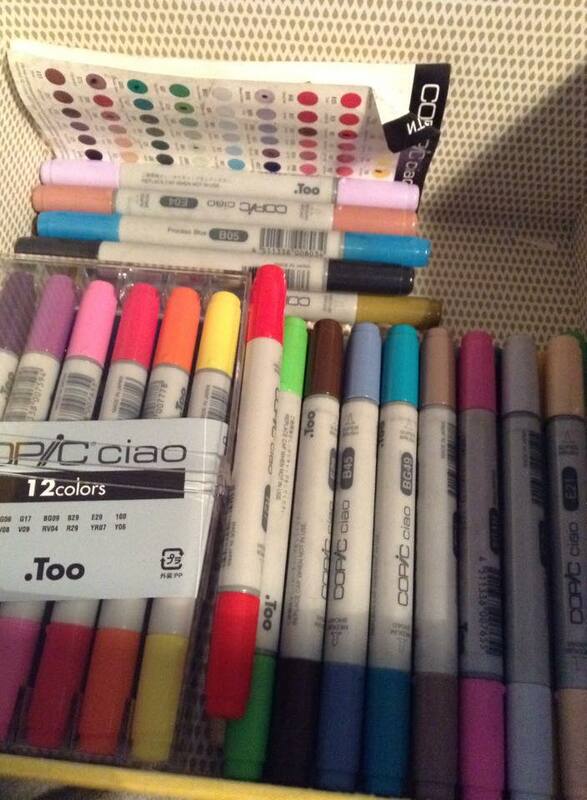 My name is Pia and I am a stationery hoarder. Aren’t these just stunning? The one on the right came in our goodiebag and I bought the other two for important freelance journo purposes. You’ll see one of them at a perfume event soon. I’m going to be watching what happens with Yardley with interest. Based on what I learned earlier this month at the press launch, I think they deserve to do well, and I hope their new fragrances get noticed by the right people. Modern classics in the making? We shall see. * Stationery + artistic penmanship + perfume = a pretty perfect event for me, let’s face it. Now add something Moomin, Ghibli, Muppet or science fiction-related and I’d be first in the queue. That’s pretty unlikely to happen, though. Once upon a time I co-arranged the first UK Basenotes meet with Grant Osborne and a whole bunch of people came – many of whom became good friends. 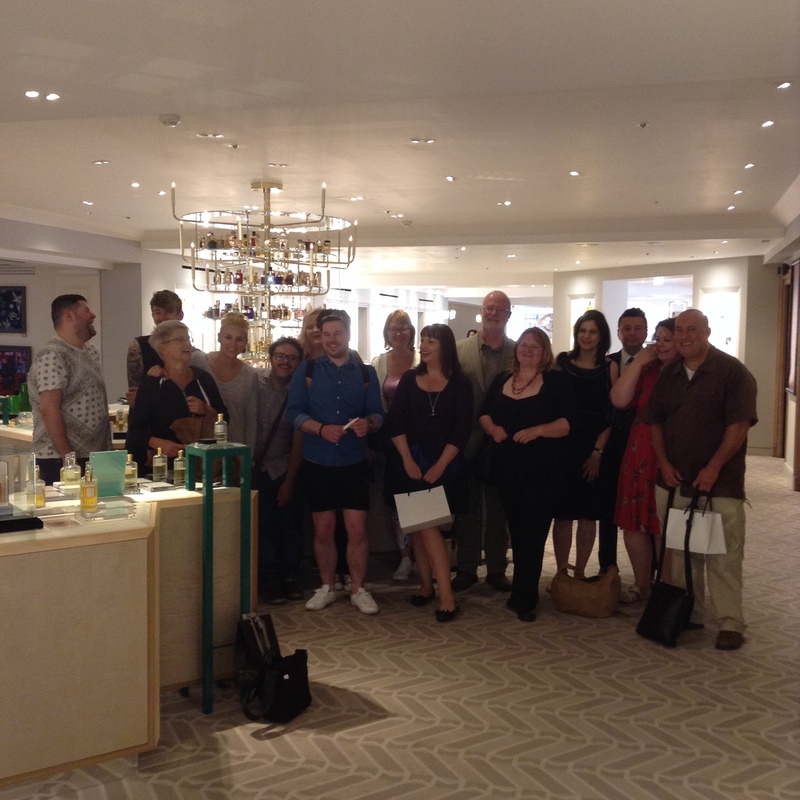 It’s the friends from that day and a few new ones each year who amble around London perfumeries with me. We also tend to indulge in nice things to eat – cake, afternoon tea, or exotic snacks (or lunch, ice cream, gin and chips like yesterday). This year we changed the date from a Saturday in May to a Thursday in July because Valerie Cookie Queen Sperrer was going to be in London and we all wanted to meet her. 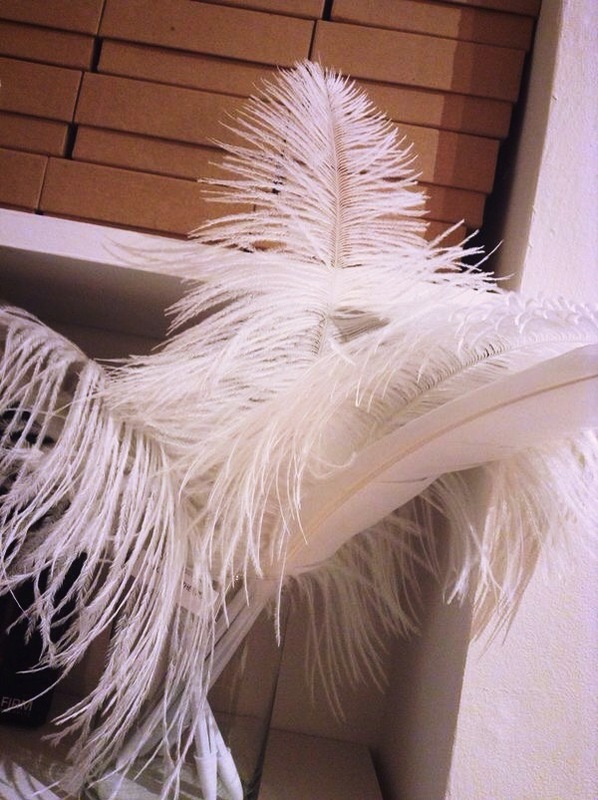 To add to the serendipity, Odysseusm from Basenotes was in the UK all the way from Canada and I was so happy to have him join us. Then the tube strike was announced. Irrespective of solidarity, the general reaction was very sweary. Of ALL days, it had to be the one that had been in the calendar for months AND could not be changed because we had more than one person from overseas! However, everyone shrugged it off. Ok, so there’s a strike – so.what. 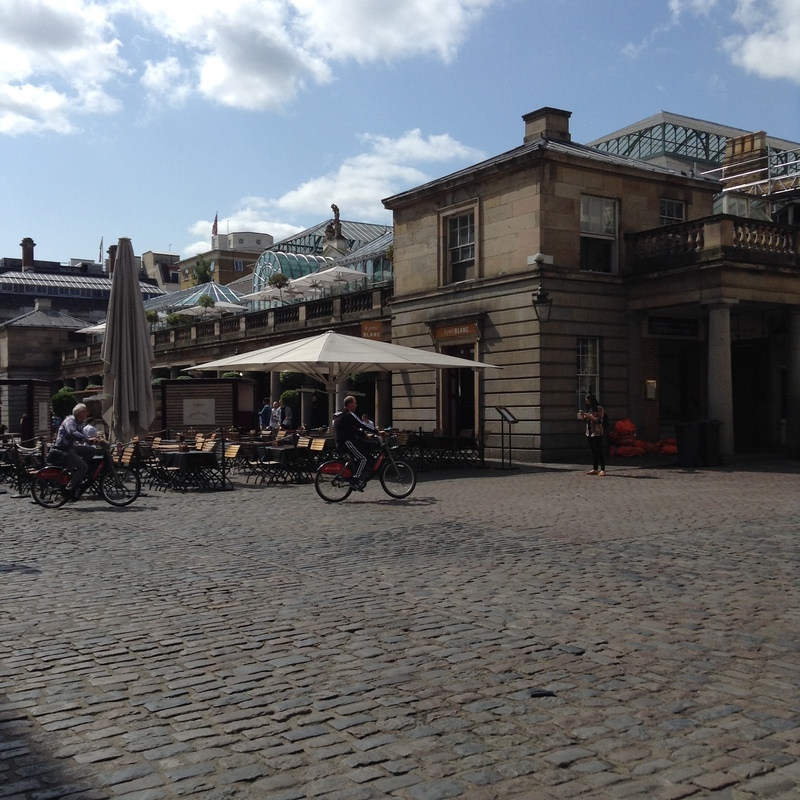 We made our way in groups and alone to our first stop in Covent Garden by various means (mostly on foot) and actually, tube strike London was gloriously empty and quiet. We also lucked out on the weather – warm, sunny; not too hot. 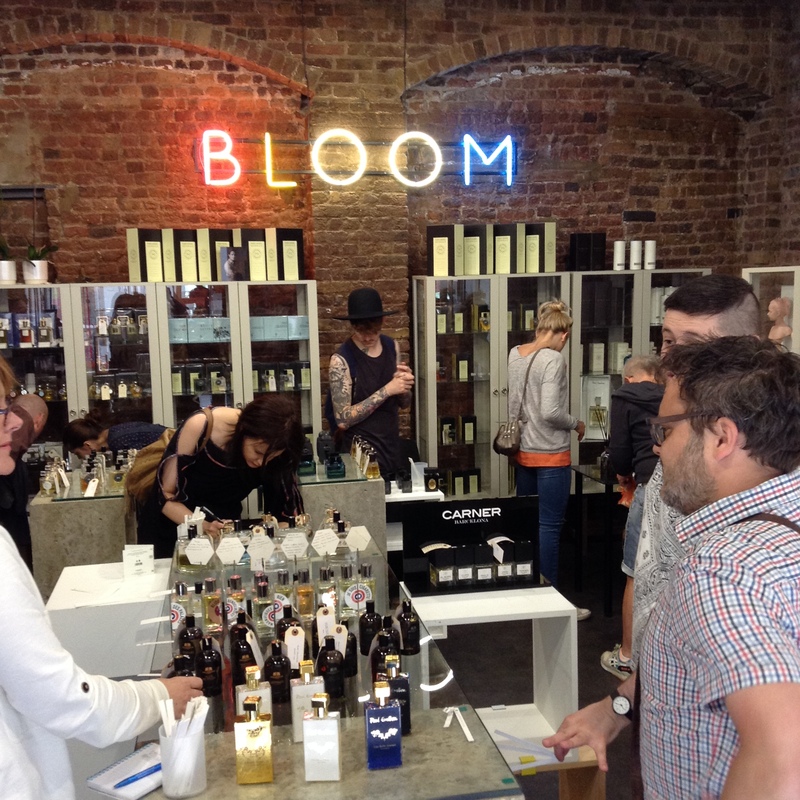 We headed to Bloom afterwards and had a great time sniffing our way through scents and chatting. Had I known in advance that Antonio Gardoni from Bogue Profumo was going to be there at 4pm, we’d have arranged our visits another way, but our group was very good about going with the flow, so we just went to Bloom twice in one day. As you do. After our (first) Bloom visit, we had lunch at Bill’s in Covent Garden and I can’t recommend them highly enough after our seamlessly organised and tasty experience. They accomodated our large group very well and the food and service were both excellent. Will definitely be going there again! 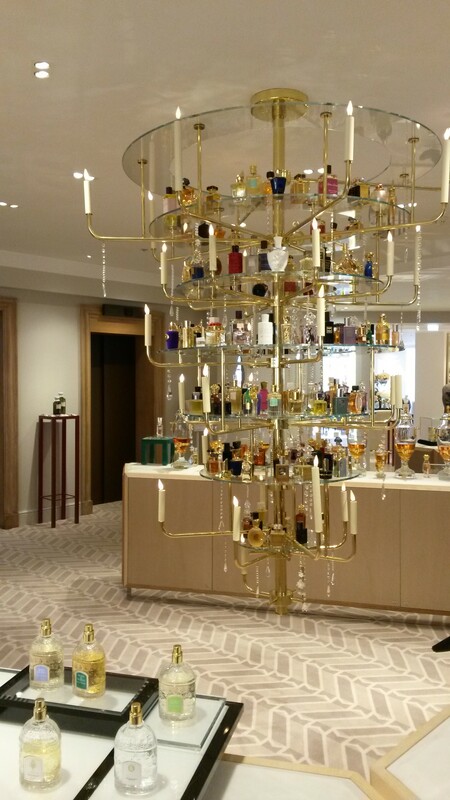 We walked over to Fortnum & Mason because I wanted to take everyone to check out the revamped perfumery. 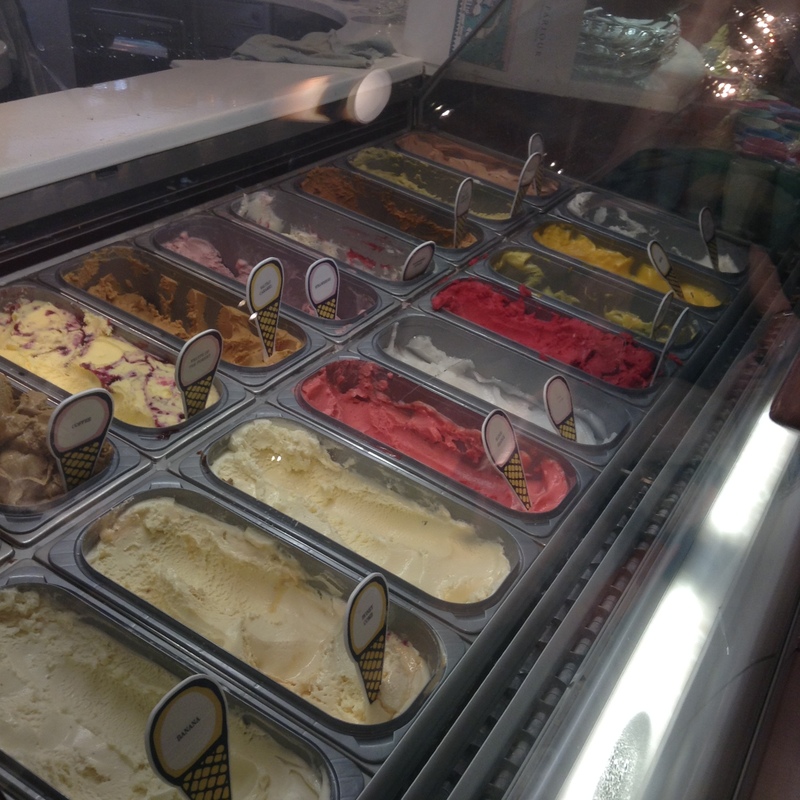 Ice cream was also purchased (to go) from the Parlour (I had a blood orange sorbet which was perfect) and we walked back to Bloom to meet Antonio. 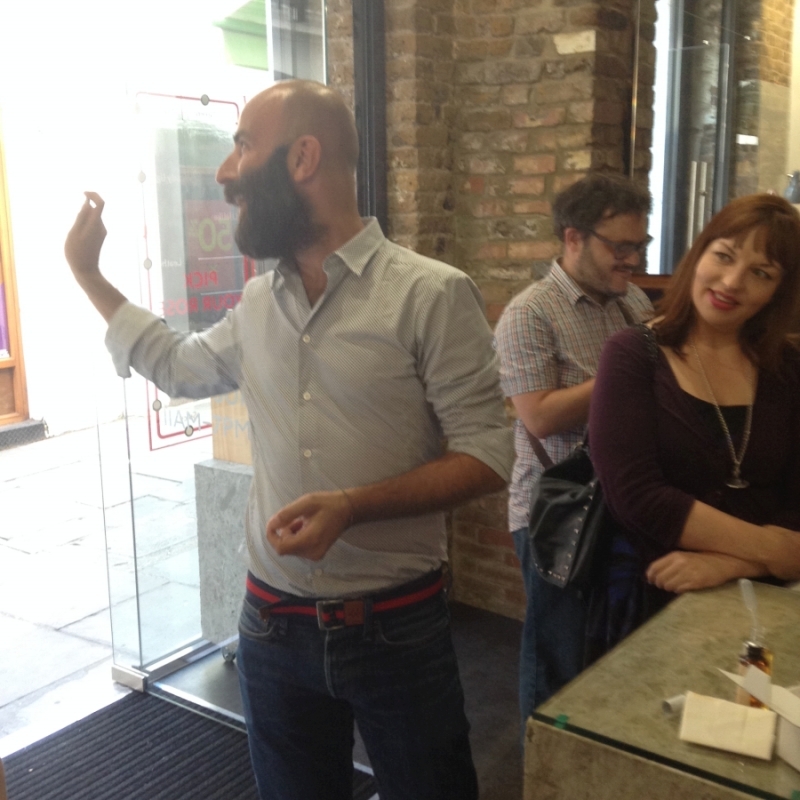 Antonio is such a charismatic man that I think we all swooned a little bit… he let us smell various blends and components he uses for his perfumes which was an interesting insight into his process. 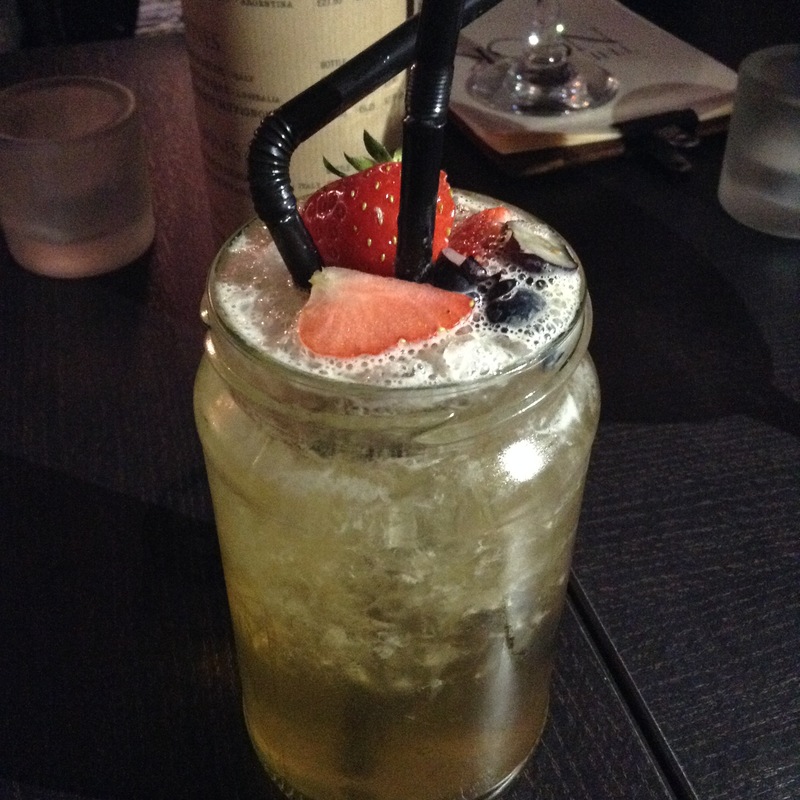 Some of us felt thirsty, so we headed to Nook and spent a couple of hours taking advantage of their two-for-one cocktail offer (I only had mocktails, by the way – the same can’t be said for the others…). I popped here before our meet and bought a lippie – excellent customer service! I have a whimsical hobby. 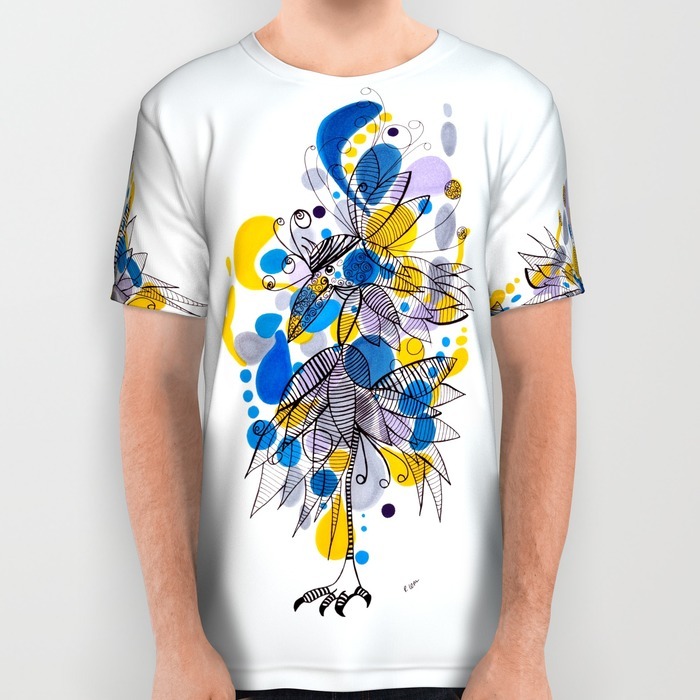 I draw, paint and create photo manipulations for fun. 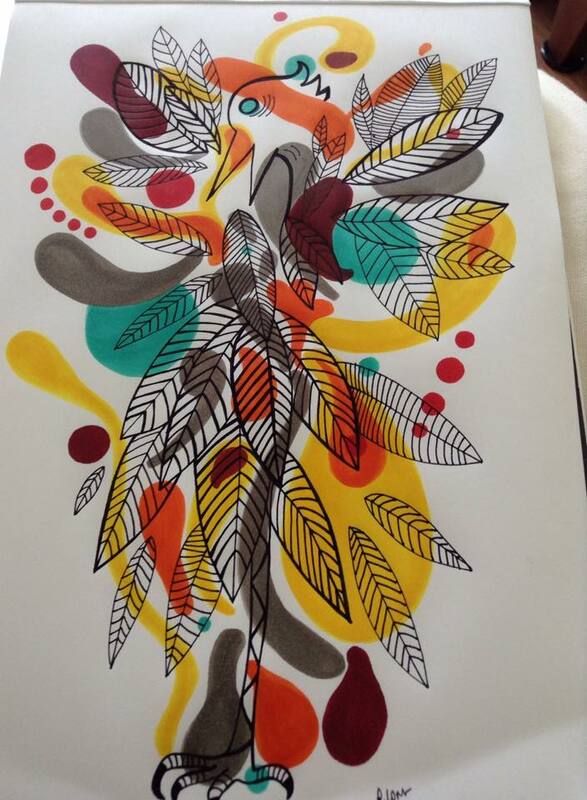 I’m no professional artist, but have always been doodling and did originally consider some kind of art career (with hindsight, I wish I’d known about textile design when I was a teen. 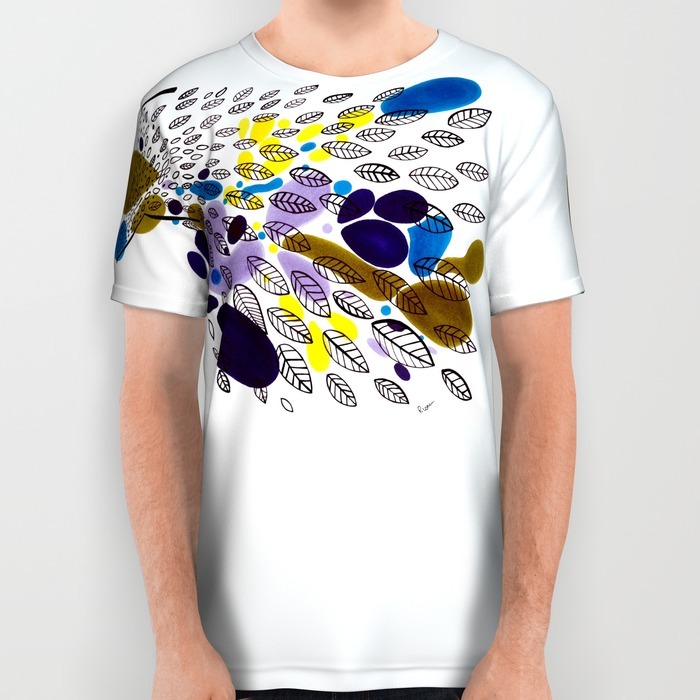 On the other hand, I am very glad to be working with perfumes now, and with sites like Society6 even amateurs can have a go at popping designs onto various products). The way the templates are set up is a little bit limiting (for example using the same template for both laptop and iPad skins). 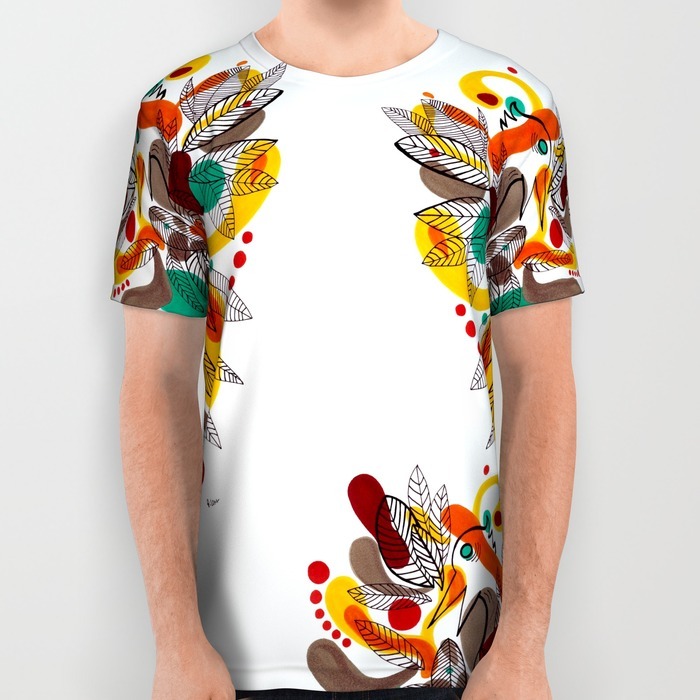 My favourite template on the site is the all-over print t-shirt – I had a lot of fun designing those. 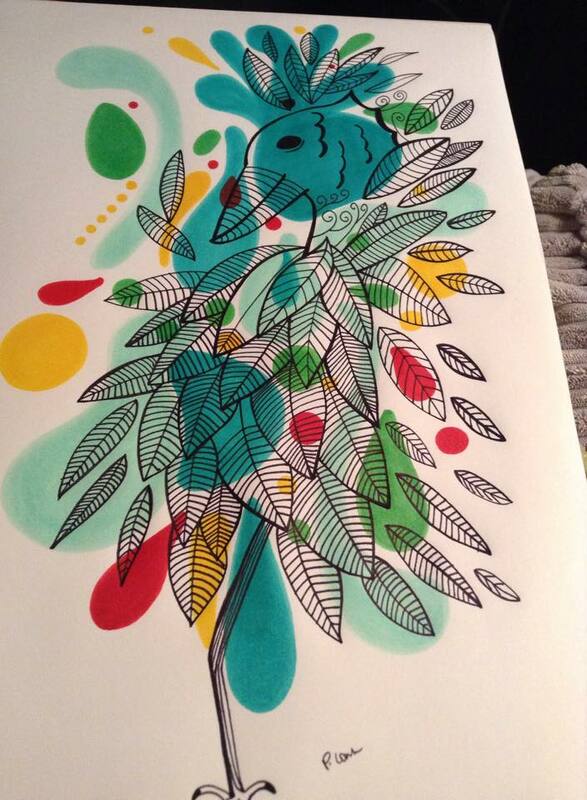 I use Copic Ciao markers on paper and tidy any smudges from the scan in Corel Painter. 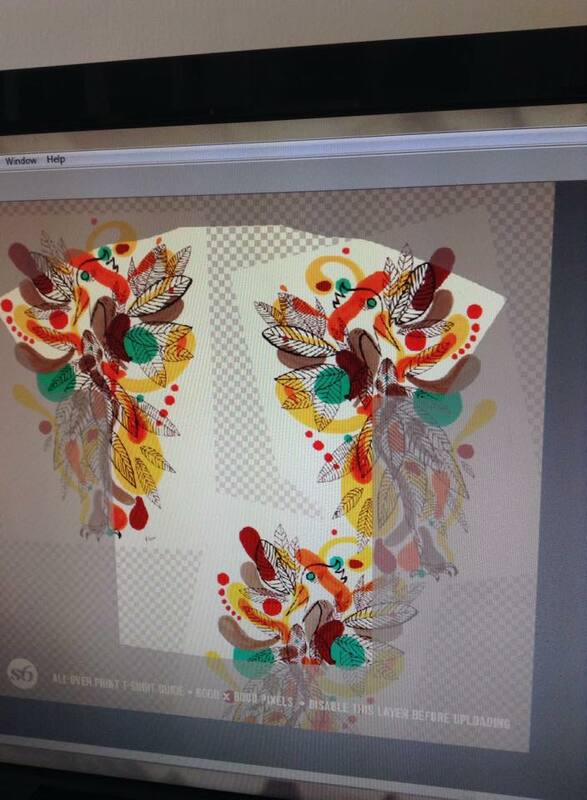 That’s it for these – so the illustration quality is definitely hand-drawn and not defined and solid. I think it works for these images. 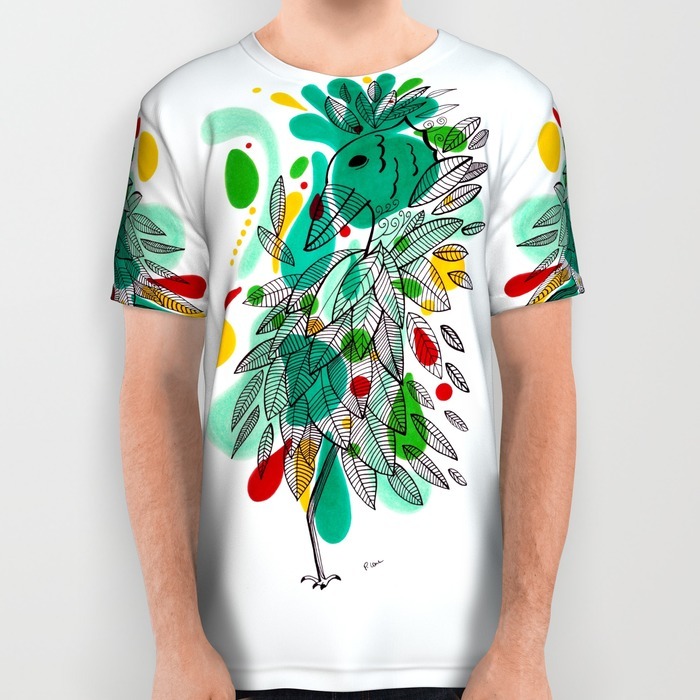 Pop over and take a look at the available products – I’ll be adding new designs from time to time (I doodle in the evenings and weekends when I want to do something creative and useful. It’s a bit like my version of knitting). I’d really appreciate any tweets and Facebook posts to spread the word!